Megan often has her nose buried in a book. When she’s not reading for fun, she is studying to take the bar exam this summer. Megan recently graduated from law school at Northeastern University in Boston, but she didn’t always think that her life could take her so far from her home in California. At this point, Megan and her mom decided to learn more about getting a Canine Companions hearing dog. 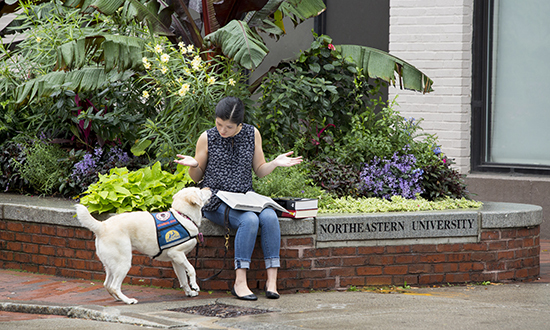 It was Megan’s experience at Canine Companions for Independence that motivated her to pursue law school. “Being with a group of people who all needed hearing dogs like I did, inspired me to become a lawyer and advocate for people who are deaf or hard of hearing,” she says. Professional trainers at Canine Companions matched Megan with her hearing dog, Ras. This two-week process, called Team Training, carefully matches individuals with disabilities with assistance dogs and helps them learn to work effectively as a team.